Walker worked exclusively in portraiture, using colored and lead pencils, crayons, pens, and markers to create her images. When she first began to draw she worked on the back of whatever paper she could get her hands on, from the prison newsletter, to training leaflets. Their similar palette, the forward-facing subject, and the similarities in the facial features, particularly the eyes, characterize her earlier works. Elizabeth Bayley, a teacher in the prison, discovered Walker’s drawings after a class one day. Bayley “was struck by their originality, their humor and their amazing attention to detail.” Convinced of Walker’s talent, she showed the drawings to her friend Pat Parsons, who owned a gallery in town. Parsons quickly took an interest in Inez and the two became good friends. She encouraged Walker’s drawing, and provided her with better quality supplies. Parsons also put on Walker’s first exhibition, in her gallery in 1972. Walker was known for her use of lines and patterns, often filling the page with them. The subjects of her drawings – it is not clear whether they depict the “bad girls” who surrounded her in prison – are rendered in a compelling and curious manner with an extraordinary attention to detail, something typical of folk artists. One of the most striking aspects of a Walker drawing is the eye. The vast majority of her subjects possess the same oversized eye that faces forward, regardless of the direction the body faces. The eye dominates the page in part because Walker always began by drawing the face and head, and then worked her way out until she ran out of page. The collection of the Fenimore Art Museum contains three of Inez Nathaniel Walker’s drawings: Man with Cigarette, Woman, and Woman with Hat. Walker disappeared from society around 1980. 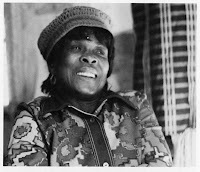 Sadly, Pat Parson found her several years later, in the Willard Psychiatric Center in Willard, New York. Walker was in and out of the center for the last four years of her life, and died there in 1990. She left behind a collection of work remarkable in its size and consistency as well as in the remarkable manner in which the eyes engage the viewer. Clearly that is where the artist looked first to take the measure of a person. This post was written by Johanna Blume of the Cooperstown Graduate Program as part of my elective course in American folk Art. Stopping to smell the roses – or look at art – is not the sort of thing that crosses your mind when you are hurrying through a busy subway station in midtown Manhattan. On my recent trip to New York, however, I couldn’t help making a pilgrimage to one very important and nostalgic spot: the Fifth Avenue and 53rd Street Station, where Ralph Fasanella’s magnificent 1950 painting “Subway Riders” sits encased behind glass. I know this painting well from years of seeing it up close in Ralph’s studio in Ardsley. He painted it after several years of riding the subway at all hours and sketching people on pieces of newspaper. It summarizes the daily transience of the urban dweller, the temporary moment in every day when one retreats to a zone of solitude in one of the noisiest and most public spaces. The painting “Subway Riders” seems to embody the notion that people of all backgrounds and from all levels of society share these moments. The great paradox of the work is the aloneness of togetherness in the course of a working day. In 1991, union organizer Ron Carver founded an initiative to bring Fasanella’s art to the public. His organization, called “Public Domain,” actively raised funds to purchase the artworks out of private collections and place them on permanent public view. Not in museums, necessarily, but in spaces frequented by working people. Hence the painting in a subway station, installed there in 1995. “Subway Riders” is actually owned by the American Folk Art Museum, which is right down 53rd Street near 6th Avenue, but on permanent loan to the MTA for display in the station. Public art is a noble endeavor, but not without its challenges. On my recent visit, I noticed that although untold thousands of people must see this painting every day, very few probably actually look. My informal observation seemed to indicate that they are more interested in the subway map next to the painting case (art should be useful, right?) and in the horizontal shelf in front of the case, where they could put down their cell phone and write down a number or note to themselves. Sometimes I think that it’s better for a painting to be admired by hundreds than ignored by thousands. But that is a facile and ultimately pointless perspective. Seeing Fasanella’s masterpiece costs nothing (it is outside the turnstiles) and is on view 24 hours a day. Besides, you don’t need to study a painting to take something from it. A thousand sidelong glances places this work in the minds of many, regardless of whether they absorb it in detail. I like to think that in some small way “Subway Riders” gets people to realize that no matter how absorbed in our daily lives, we are all connected. New acquisitions are always exciting, and I’ve written about several in this blog over the past few months. But the work that goes into uncovering information about these pieces is just as interesting, and ultimately is what makes the items matter for the collection and the public. One case in point is the ongoing research being done on our new painting, Massachusetts Band Leader, donated to the Fenimore Art Museum by Mrs. Patricia Selch in honor of her late husband Frederick. I gratefully accepted this painting (and announced it in a post in January) because I felt that it was an exemplary piece of American folk painting from the middle of the 19th century, and had all of the desirable aesthetic attributes of the genre: bold color, linear and patterned composition, interesting details. Even though its past was shrouded in mystery it was clearly a superior work of art, and worthy of the company it will keep in Cooperstown. Now the painting’s history is slowly coming to light, thanks to research being conducted by Nan Chisholm. While perusing some of the early books on American folk art, Nan made a startling discovery. 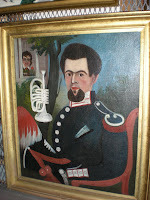 Our Massachusetts Band Leader was published in a 1942 book by Carl Dreppard entitled American Pioneer Art and Artists. Published during World War II and including a somber foreword by the artist Rockwell Kent, the book celebrated the distinctively American qualities of a wide range of folk arts at a time when the authors admitted that the future of democracy was by no means assured. Our portrait appears on page 74, under the title “Man and Horn.” Dreppard makes the point that although the artist was careful to identify the maker of the horn as E. G. Wright of Boston, he or she neglected to sign the painting. The most important information appears at the end of the caption, where the piece is identified as being from the Harden DeV. Pratt Collection. Mr. Pratt was a conductor working in Boston in the middle of the 20th century, and was not hitherto known for collecting folk paintings. It’s obvious now that this appealed to him because of the musical connection to the subject. This seems fitting for a work honoring the man – Frederick Selch – who greatly advanced our knowledge and appreciation of American music through his exhibitions, publications, and remarkable musical instrument collection now at Oberlin College. But we would never have known that if not for an indefatigable researcher trolling forgotten volumes on the dusty shelves of her library. The quest for new objects is always about the quest for new knowledge. There are literally hundreds of great artworks in the Fenimore Art Museum’s folk art collection, and our main folk art gallery only holds about 75 – 100 of them. So it stands to reason that you will occasionally find phenomenal masterpieces in storage, usually when touring a collector through the stacks and smiling politely when they look at you aghast at seeing such wonderful stuff not on view. 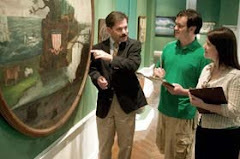 A few years ago we had the great pleasure of hosting a group of folk art collectors here in Cooperstown. One of them is an expert on early American scrimshaw. When he saw what we had in storage he was very surprised, and much more polite about it than he needed to be. In a far corner of our storage facility, stacked in a vertical unit with a host of other walking sticks, is one of the greatest scrimshaw canes in America. Who knew? It’s not scrimshaw in the strictest sense of the word. Scrimshaw developed in the early 19th century with the rise of the commercial whaling industry. It was a leisure activity of the whalers who endured long voyages in pursuit of Sperm whales whose oil (from the blubber under their skin) was widely used for lighting. Scrimshanders (as scrimshaw artists were called) engraved images into the teeth and jawbones of the whales, and then covered them with a dark pigment that, when wiped away, left dark lines where the bone was incised. The images ranged from portraits to patriotic symbols to pictures of ships and far-off ports. Our cane was likely made from the jawbone of the whale, and rather than having incised designs it features mother-of-pearl and tortoise-shell inlay as its main design element. The range of images is remarkable, and includes Sperm whales, boats, American eagles, and even the figure of Miss Liberty holding a Liberty cap and, in another image, a flag. The cane is about 35” long, and the maker is unknown. The date is also hard to ascribe, but I would guess it to be 1825-1850. This treasure of our maritime past will be on view for all to enjoy in our folk art gallery starting on April 1st. And trust me, I’ll make sure our collector friend knows it’s out of storage. 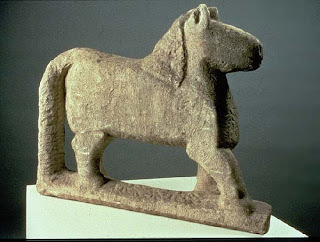 Stone is an elemental and stoic medium. In the hands of a deeply religious man with a lifetime of hard experience behind him, it can be singularly powerful and inspiring. Convinced that Jesus had “planted the seed of carving” in him, Edmondson began his work by carving memorials, mostly embellished by doves or sheep, and most commissioned by members of his congregation for use in their cemetery (see photo). Before long he was carving animals and human figures, angels and crucifixions. 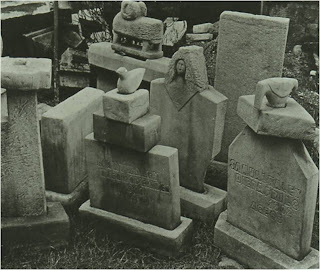 As he put it “First He told me to carve tombstones, then He told me to cut the figures.” His style was distinctly “modern,” with generalized forms and a tendency toward abstraction. He worked with a homemade chisels and files on locally available limestone blocks. Between 1934 and 1937 fashion photographer Louise Dahl-Wolfe, acting on a tip from a friend, photographed Edmondson and his sculpture. She shared her photos with Alfred Barr, Jr., then Director of the Museum of Modern Art in New York. Barr was the most important proponent of contemporary folk art during the 1930s. 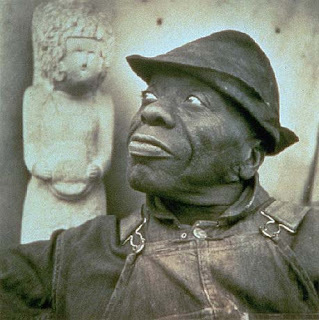 In 1937 Barr did something no one had ever thought to do before: he put together a small one-man show of 12 stone carvings by Edmondson, the first single-artist exhibition of an African-American in the museum’s history. In 1938, one year after Edmondson’s one-man show at MOMA, Barr organized the MOMA exhibition Masters of Popular Painting, which featured both American and European self-taught artists, including Edmondson along with noted self-taught artists John Kane, Lawrence Lebduska, and Horace Pippin. Seven years after beginning to carve, Edmondson had reached the pinnacle of achievement in the emerging art capital of the world. We are very fortunate to have one of Edmondson’s pieces in the Fenimore Art Museum collection. It is s carving of three birds, very reminiscent of the artist’s early work in gravestone carving. Measuring 11 ½” in width, its precise meaning and date are unknown. Its minimalist lines and formal rhythms seem to me a reflection of the Edmondson’s mastery of craft and clarity of vision. It’s been a great season of new acquisitions for the Fenimore Art Museum folk art collection, as you last saw in my posts about the portrait of the band leader and Kyra Hicks’ Black Barbie quilt. This past January I also encountered a great work of art at The American Antiques Show in New York. Actually, I encountered one of our trustees, Jeff Pressman, who told me about the artwork. The piece that caught Jeff’s eye is a large watercolor and ink drawing of the world by a young female student probably as part of her course of study at an academy. Always anxious about the prospect of someone buying things like this out from under me, I immediately hopped the subway to The American Antiques Show and sought out the booth of Sam Herrup, where this piece was hung. It was even more spectacular than I had imagined. The young artist, Mary Hollister, had produced a stunning rendition of both hemispheres of the world on two large sheets of paper. Her work included a fanciful outline of all of the various countries filled in with vibrant strokes of watercolor, and embellished with lively calligraphic inscriptions on the margins. At the top of the Western Hemisphere she included an American eagle, and above the Eastern Hemisphere she put a hot air balloon; symbols of home as well as of adventure in far-off lands. The entire work is covered with minute penwork marking everything from the waves in the oceans to the edges of the picture. We know from Mary’s inscription that she lived in Ballston, New York (north of Albany) and completed this work on March 24, 1832. She even included her instructor’s name, S. Cole. But here’s the really startling thing about the piece: Mary Hollister was born in Burnt Hills, New York on May 8, 1820, making her just 11 years old when she painted this folk art masterpiece. We have a good number of strikingly beautiful schoolgirl pieces in our collection, and they always amaze me when I see the age of the girls who produced them. Most of our pieces are needlework pictures, so this map watercolor stands out by virtue of its medium and its size (it measures 23 ¼ “ x 38 ¼ ”). So now Mary Hollister’s map of the world is now installed in our main folk art gallery, and she joins our roster of superb nineteenth-century schoolgirl artists, a small-town, preteen girl with an astonishingly sophisticated worldview. My recent post about our new acquisition of a carved wooden plaque from the Elmira Reformatory caught the attention of several readers who wanted to see other examples of prison art in the Fenimore Art Museum collection. I’ve been meaning to post about a magnificent work that we have from the Auburn Prison (founded in 1816 and renamed Auburn Correctional Facility in the 1970s) in Auburn, New York, so this seems like a great reason to do so. It is a large (23 ¼” square) and elaborate checkerboard complete with a separate box of 24 checker pieces. Every inch of the piece, no matter how large or small, down to each individual checker, is decorated with wood marquetry inlay in lively patterns. Using hundreds of tiny pieces of a variety of woods, the unknown maker created details such as pinwheels on the checker squares that match those on the checker pieces, a parquet design on the border around the playing surface, and many other fancy border designs around the outer edge of the board. As far as we know, this piece was made before the 1870s, when it was given to a David Upton, an ancestor of the donors, “in payment of a debt.” It sat in the family’s Rochester, New York attic for more than 70 years. It was given to us in 1977 by Mr. and Mrs. Russell Crosby, in memory of Ruth Upton Morgan and Leah Upton Marlowe. It is worth noting that the Auburn Prison espoused a system of prisoner reform that included labor and hard work. 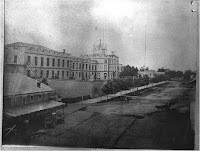 The “Auburn System,” as it was known, compelled prisoners to work during the day, with the profits of their labors going to support the operation of the prison. The prisoners worked in silence, as the prison rules forbade any conversation. They wore the prison’s signature outfit, the horizontal black and white stripes we now associate universally with convicts everywhere. When they walked from one part of the prison to another the prisoners were compelled to walk in lockstep, one hand on the shoulder of the prisoner in front of each. Hardly an atmosphere for creative expression. But the Auburn Prison is known for the beauty of its hand-crafted products. Of particular note is the decorative cabinetry that reflects the same skill and care so evident in our checkerboard. Several of these pieces were featured in a 2003 exhibition, “Both Sides of the Wall,” at the Cayuga Museum of History and Art in Auburn. One of them is pictured at left above. I have written often in this forum about the passion, vision, and commitment of self-taught artists. Our checkerboard, however, forces us to confront the issues of creativity in different ways. How do we account for uncommonly beautiful items made under forced labor? Perhaps the unknown maker of this piece, living in silence and marching in lockstep, poured all of his remaining humanity into the delicate tracery that delights our eyes today.